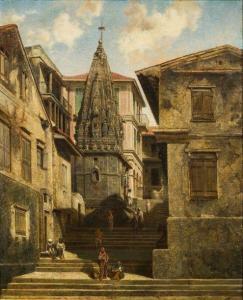 Find artworks, auction results, sale prices and pictures of Pierre Toussaint F. Mialhe at auctions worldwide. 41 x 57cm (16 1/8 x 22 7/16in). Frédéric Mialhe arrived in Cuba in 1838 under contract to the printers Real Sociedad Patriótica to record views of the island. Enamoured by the richness and exoticism that surrounded him, Mialhe remained in Cuba to produce further work; he also taught drawing at the Liceo Literario y Artístico in Havana. The artist returned to France in 1854. 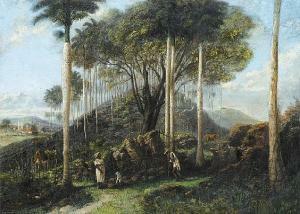 Felipe Poey, the founder of the Museum of Natural History in Havana, often accompanied Mialhe on his painting excursions into the Cuban hinterland and remarked that: "Mialhe carried along a blank book and his admirable pencil, which, they say, drew by itself, though probably helped by Mialhe's fingers and thumb". Mailhe is best knwon for his series of lithographs Isla de Cuba , Isla de Cuba Pintoresca and Viaje pintoresco por la Isla de Cuba . 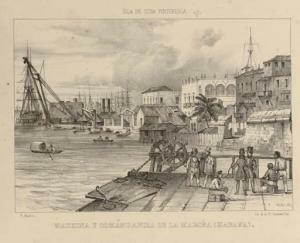 These magnificent albums of lithographs depicted daily life in Cuba and its capital in the mid-19th century. A pencil study for the above work is extant with an indistinct inscription "Corral para via de ????". Isla de Cuba pintoresca. 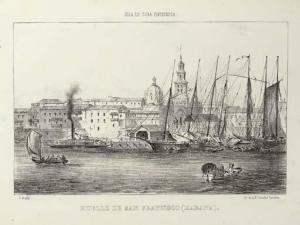 [Havana]: Litografia de la Real Sociedad Patriótica [n.d., but c.1839-42]. Oblong 4° (260 x 347mm). 29 lithographed plates (only, of 49?) after Frederic Mialhe, 6 with later hand-colouring. (Spotting and occasional browning throughout, plate I with old fold.) Contemporary blue cloth, title in gilt on upper cover, with bookseller's ticket on rear pastedown (extremities rubbed, some minor staining, hinges partially cracked, head and foot of spine starting to detach). EXTREMELY RARE ALBUM BY CUBA'S MASTER LITHOGRAPHER: 'ONE OF THE MOST OUTSTANDING ENTERPRISES OF ITS KIND EVER ATTEMPTED IN CUBA' (Cueto). 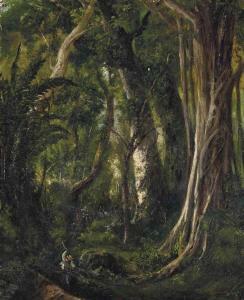 Mialhe left France for Cuba in 1838 to become the landscape painter of the lithographic firm newly established by François Cosnier and Alexandre Moreau de Jonnès under the sponsorship of the Royal Patriotic and Economic Society of Cuba. These so-called 'French lithographers', rivals to the Spanish workshop of the Costa brothers, became the foremost such venture in Cuba. The lithographs were scheduled to be issued in twelve instalments of four prints each, but such an ambitious scheme could not be sustained and publication became intermittent after the ninth issue. Although the figure of 49 has been suggested, it is difficult to establish with certainty how many plates were actually produced. RARE: no other copy of Mialhe's Isla de Cuba is recorded at auction by ABPC since 1975. Palau 121980; Cueto, Mialhe's Colonial Cuba, pp.1-3, 25-28.